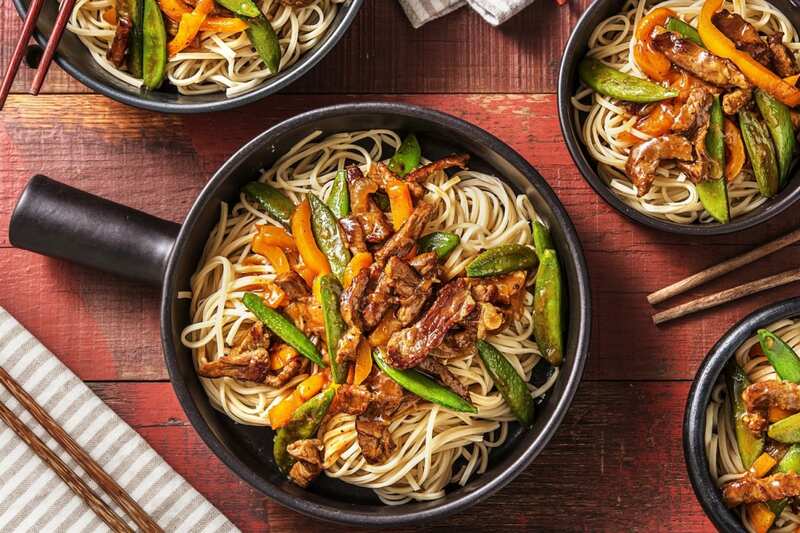 Chow mein noodles make the base of this fantastic stir-fry! These are popular egg noodles in Asian cuisine, particularly in stir-fries. Tonight they are paired with juicy beef and a sweet and salty sauce. Don't be afraid to slurp and enjoy each bite! Don't have a garlic press? 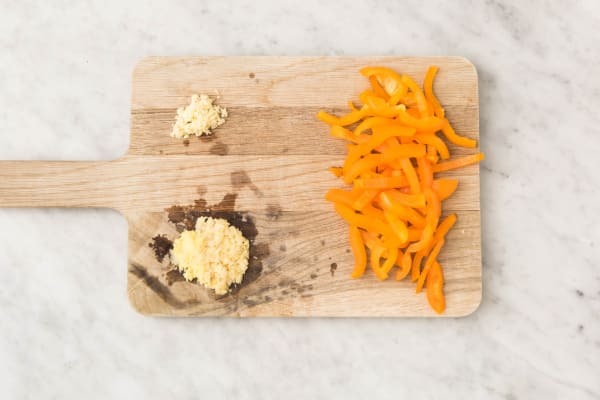 Lay the garlic cloves on a chopping board, then place a chef’s knife on top and press down firmly to crush. Finely chop the garlic. Wash and dry all produce. * In a large pot, add 10 cups hot water. Cover and bring to a boil over high heat. Meanwhile, peel, then mince or grate garlic. Peel, then finely grate 2 tbsp ginger. Core, then cut bell peppers into 1/4-inch slices. Cut stems off sugar snap peas, if needed. Pat beef dry with paper towel, then cut into 1-inch pieces. Season with salt and pepper. Heat a large non-stick pan (or a large wok) over medium-high heat. 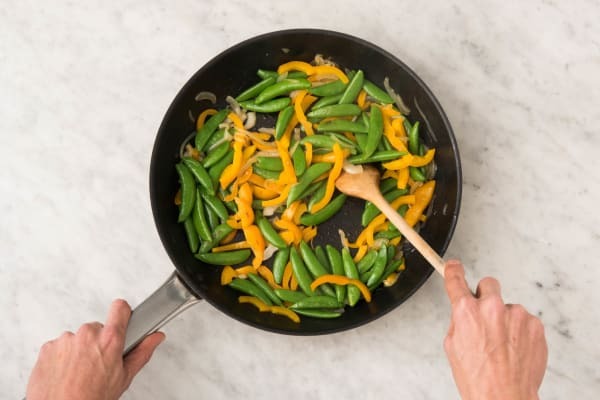 When the pan is hot, add 2 tbsp oil, then onions, snap peas and bell peppers. Cook, stirring often, until veggies are tender-crisp, 4-5 min. Transfer veggies to a plate and set aside. 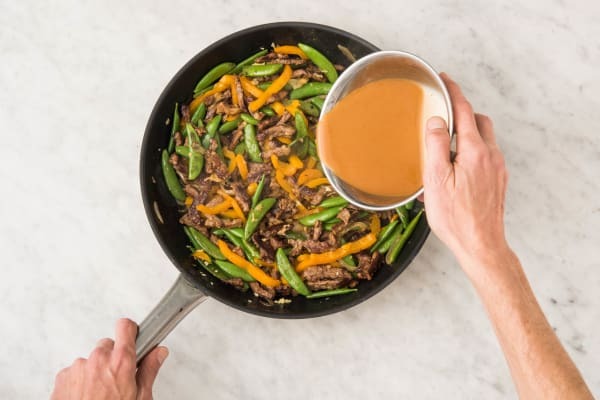 To the same pan, add 1/2 tbsp oil and half the beef. Cook, stirring occasionally, until browned, 4-6 min. (TIP: Cook to a min. internal temp. of 71°C/160°F. 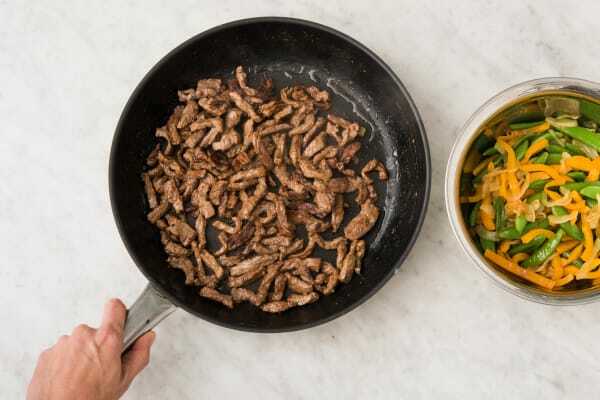 **) Transfer to a plate and repeat with another 1/2 tbsp oil and remaining beef. 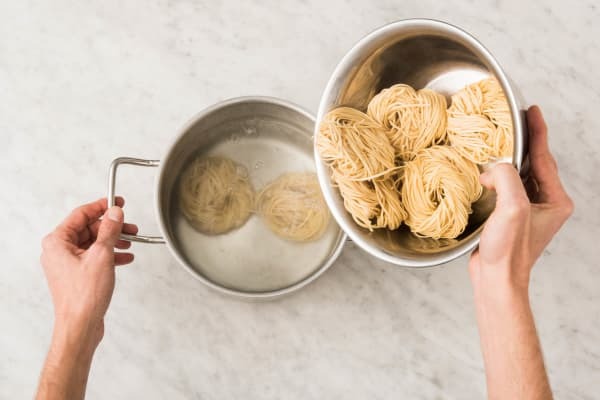 Meanwhile, in a medium bowl, whisk together cornstarch and 1 1/2 cup cold water. Whisk in hoisin-soy sauce, rice vinegar and sweet chili sauce. Set aside. To the large pot of boiling water, add chow mein noodles. Cook, uncovered, until tender, 1-2 min. Drain, then return to the same pot. Add 2 tsp oil and gently toss to coat. Set aside. When second batch of beef is browned, return cooked beef, veggies to the same pan, then add garlic and ginger. Cook, stirring together, until warmed through, 1-2 min. Add sauce from the medium bowl and stir until sauce slightly thickens and veggies are coated, 1-2 min. 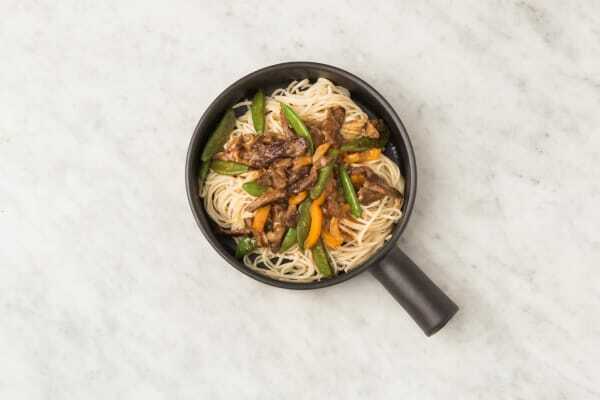 Divide noodles between bowls and top with beef stir-fry.